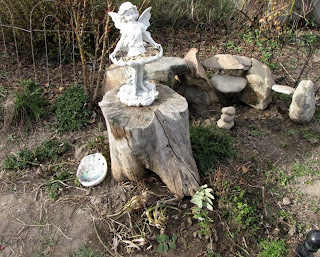 We've had a Faery Garden for a few years, now. I don't know that it's any more enchanted than any other Faery Garden, but we'll share what we know with you. 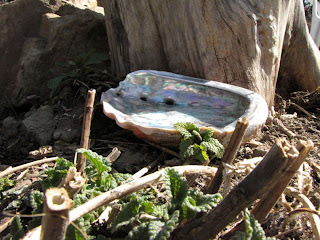 There are probably as many ways to make fairy gardens as there are people who make them. They can be planted according to the laws of Magick, corresponding with the proper phases of the moon, and in accordance with friendly astrological phases. They can be planned and planted according to Victorians, folklore, whimsy, and your own style. But I'd say if you're inviting the Fey and their Magic, then by all means--use a bit of Magic. Faeries like what their less ethereal friends do. If you've officially invited butterflies and hummingbirds into your garden (by planting things they love), chances are you've made faeries feel welcome as well. But to make it particularly Sparkly, there are a few things to keep in mind. North: The north is the direction of the element Earth. This means plants that are ruled by Earth would best be suited here. I try to think of earthy, woody things. Like yarrow. Peas. Things that seem "woods-y" and earthy. 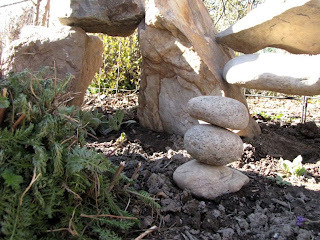 It is also the perfect place for tall stones - butterflies appreciate rocks to shelter them from the wind, and no doubt your faery friends will appreciate them for a midnight game of hide-and-seek! East: East is the direction of Air (Wind). Colors are gentle yellows, pinks and purples. Often aromatic herbs should be planted here. South: South is Fire. Fiery plants are ones of bright oranges, yellows, and reds. And things with names like SnapDragon. Redhot Poker. Sunflower. West: The element of West is Water. The colors of Watery plants are blues and greens. Also necessary for a butterfly garden is a spot of water. Our dish is a large abilone shell that we keep in the shade of the shasta daisies, and try to keep filled for the butterflies on a hot summer's day, as well as a pretty place for the faeries to splash at night. Traditional Faery plants are the rose, yarrow, thyme, snowdrops, clover, foxglove (fairy's glove), tulip, lily, lavender, nasturtium, lilac, cowslip, meadowsweet, passion flower, cinquefoil, pansies, bluebells, poppies (though poppies don't like other flowers planted near them), rosemary, lemon balm, primrose, marigold, heather, and violet. Butterflies like a pretty fence to land on. 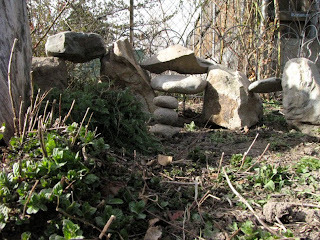 They also require shelter - a wall or tall rocks will do - and they need a wet stomping ground. Think mud or sand puddle, or shallow dish. They're fond of shasta daisies, as they make a lovely cushioned landing pad. They also love alyssum, clover, milkweed, marigold, zinnias, baby's tears, passion flower, verbena, boneset, and thistle. When: If faeries are the personification of Plant Spirits, then we'd probably do well to work with the earth's cycles and phases. While there are lots of books that have ideas on when are the best times for duties in the garden, I'd say the best thing to do is to work with our own intuition and rhythms. It might seem prudent to transplant under a New Moon. Or might feel like the right time to do clean-up during the third quarter, when the moon is waning (decreasing light). 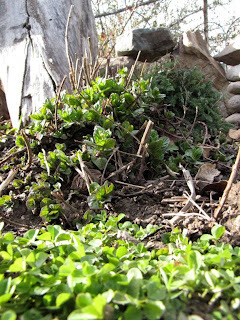 It may seem that 'now is the time' to you to transplant on a Sunday afternoon when the air seems heavy with moisture, and your garden seems especially thriving. It's best to work with the land - too cultured an environment might not sit well with your wild little friends. A weed is just a misplaced flower, so be mindful about tearing out the home of their favorite spidery playmates. Honor your area, your own green thumb, and the plants themselves by planting with harmony - ie happy companions (such as catnip and/or yarrow with roses). Do your weeding gently as you can, and with kindness. Don't uproot things when they're flowering. 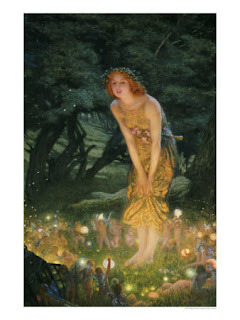 Finally you may want to honor a few celebratory days for Faeries. I had no idea there was so much careful planning needed for a faery garden. Absolutely enchanting. My girl wanted to plant a faery garden this year, but with the job uncertainness I wasn't sure. We may just do what we can and if we move the new residents can enjoy it. Lovely! Now I just have to figure out how to do a tropical fairy garden. An amazing post! I can't wait until my daughters are old enough to enjoy this. We go searching for fairies on our walks so maybe she'd be ready for this now (at 2 3/4). I'm so excited. Thank you! It was a treat to read. Thanks also for stopping by my blog. That nest idea was super simple and lots of fun. I hope you enjoy it! Oh lovely! Rainer and I were just talking about fairies and other nature spirits lately. He has become enchanted with the idea of Pan. We welcome the fairies every year. I am going to print this out. So amazing and inspiring. I think the kids will love to plan this out. OMgosh, I can't wait for warmer weather. Thanks!